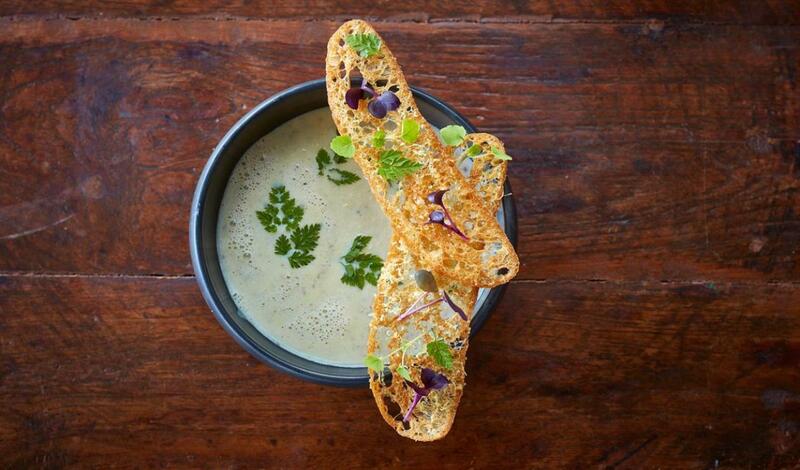 Earthy truffle perfectly complements this potato-based soup. Bring the vegetable bouillon to boil. Add the crème fraiche and the truffle paste. Add Knorr Mashed Potato flakes to bind the soup. Measure the potato flakes until the soup reaches the perfect texture. Add the parmesan cheese and blend with a hand blender to get an airy soup. If desired use a siphon to make the soup even more airy. Season if necessary with pepper and salt. Half freeze the bread so it’s helps you to cut very thin slices. Place the slices on baking paper. Grate the parmesan on the crostini’s. Bake the crostini’s for 15 minutes on 170 degrees Celsius. Check if they are crispy ,if not: bake a little longer. Poor the soup in a bowl. Finish with fresh chervil leaves. Add fresh herbs on the crostinis.